Monarch caterpillar life cycle to butterfly. Monarch Butterflies progress thru the four major life stages at different speeds. I collected a caterpillar from a milkweed leaf on September 19th 2014. I am sharing my experience with rearing this caterpillar, later named Andy, to a butterfly and releasing Andy with a tag for the Southwest Monarch Study. I found Andy on a Showy milkweed leaf. Andy was near a nature trail path and at risk of being eaten by a predator or trampled by a visitor. Due to the relatively low survival rate of monarchs from egg to butterfly in nature. I decided to load Andy in the car and take on the task of raising the caterpillar into a butterfly. Although I had read at length on the subject, I was in for a big learning experience. Andy is the first caterpillar I have attempted to raise in my home. 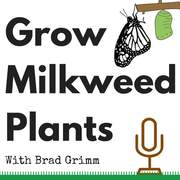 It has been a very rewarding experience that began by planting milkweed in my garden. Andy was a caterpillar when it was found. I don't have the date that it came out of it's egg. Since I don't know how long Andy has been a caterpillar it is difficult to know what date it will become a Pupa. I do know that Andy is pretty huge and I expect it to form a chrysalis at any moment. Andy is currently eating two and three inch tropical milkweed leaves at a rate of five to seven leaves per day. The tropical milkweed in my garden grew great this year. If you want to grow tropical milkweed form seed then consider buying 100 tropical milkweed seeds in my store. The tender leaves made Andy grow fast. Late last night Andy climbed to the top of the plastic box. Andy attached itself to the provided paper towel roof by creating a cremaster and began hanging in the shape of a "J". Once in this position the caterpillar is already beginning to transform. I noticed that the tentacles had become wilted and seemed crispy like ash. Fortunately, during the transformation into a chrysalis the tentacles along with the outer skin will be shed and discarded. Andy hung like this for about twenty-four to thirty-six hours. And then magically changed. After dinner I checked on Andy. No visible changes had occurred. Andy was hanging in a "J" shape and seemingly had no intention to change at all. But to my surprise it was well on it's way to a chrysalis. Only a mere thirty minutes later I returned to see that Andy was now a bright green chrysalis. Know that I know it was at 9:00pm on September 23rd 2014 that it formed a chrysalis. I began researching how long it will remain in this form before the big emergence as a monarch butterfly. I am expecting 10-14 days. Only one day form my last update and the chrysalis has become a rich green color. I find the stripe near the top to be very unusual. Looks like a part of the caterpillars skin got wrapped into its new skin. The bright yellow dots mid was down the bottom are also quite intriguing. In the photo to the lower left of the pupa is a fuzzy black thing. That is the original caterpillar skin. When it became a pupa it shed the caterpillar skin and it fell to the bottom on the tub I am keeping it in. Be sure the chrysalis is in a bright room but out of any direct sunlight. I have been waiting patiently for a few days. Without much to look at besides a green droplet hanging from a paper towell the process can seem a bit boring. So I decided to try and determent the gender of the monarch that is inside. From my research I decided that I think Andy is a female monarch. I read that there is a small vertical line on the section below the three pairs of black dots that begin at the cremaster. I have put an arrow in the spyglass pointing to the line that i think confirms my best guess. We will know soon if this method works. On a male the line would not appear below the three parallel black dots. Exactly eleven and a half days have passed since the caterpillar formed the chrysalis. Yesterday there was a darker color to the chrysalis but it is only in the last ten hours that it has become nearly translucent. The color on the wings is pretty vivid in this photograph. In this photo the Monarch butterfly is just thirty minutes away from emerging completely transformed from the caterpillar that I had less than twelve days ago. Andy is a female! Little did I know that at about 10:05am the monarch butterfly I named Andy eclose. Quickly and without notice. While I was having my morning coffee on the front porch Andy was not going to wait any longer. As soon as a monarch emerges it begins the process of expanding its wings. While the wings are strengthining and forming they are also becoming symmetrical for future flight. This process takes a few hours. The gender identity on September 27th was correct. Andy has been given over five hours to gain confidence in the ability of its beautiful wings. I tagged Andy's wing just moments before releasing her into my yard. The tag on Andy's wing includes a number and email address for the Southwest Monarch Study. If you locate a tagged monarch your can help in the process of learning about their migration by reporting the tag number and location to the contact found on the tag. I am optimistic that Andy will be found so I can learn where she has traveled. I created a video documenting the metamorphosis of Andy.